I'm assuming, Grz, that that segment of I-69 between I-49 and LA 1 can be built first and signed as I-69 immediately because it both connects to NHS highways and can be an SIU that also completes the Inner Loop extension, right? But, what would happen if, in the worst case scenario, the I-49 ICC is diverted to the Inner Loop/I-220 ("Loop It") route? Would that affect the completion of LA 3132 extension in any way? Also....if I-69 is going to use the conversion of the existing US 84 four-laned section through Logansport, there's going to be hell to pay for driving a freeway through that segment. Or, building a bypass right after widening the existing US 84 to a 4-lane divided facility, which seems cost-ineffective. It could be signed because of the connection to I-49. With the concern over "the realignment over the Texas portion of I-69", I would expect them to sign it. I guess you could make the argument that it would be its own SIU, but I don't think it is critical to whether there can be signage. Is the currently signed I-369 a SIU? I don't think so. The LA 3132 extension is not in the I-49 corridor, even if the Loop It proposal is adopted. I think Secretary Wilson's comment about the Sabine River bridges being "located on the Future I-69" simply reflects the concern over "the realignment over the Texas portion of I-69" and was intended to remind people that "mainline" I-69 goes through Louisiana. 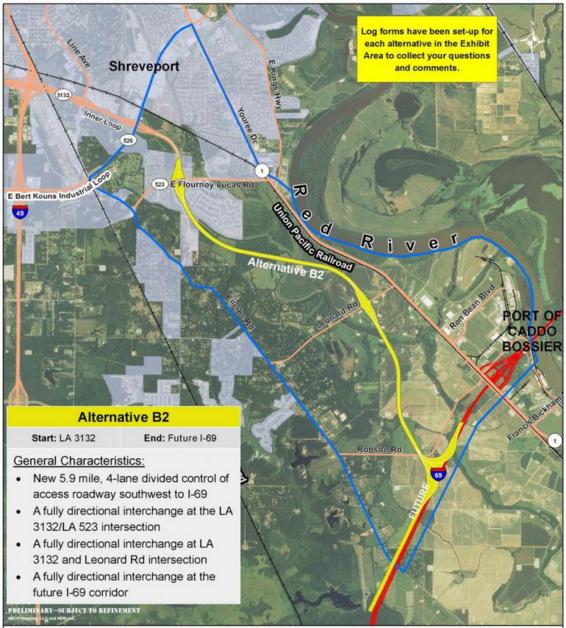 Mayor Walker stated the alignment on the LA3132 extension that would possibly disrupt or re‐open the I‐69 EIS ROD would not be in the best interest as it took so long to get that ROD. I'm not at all sure you'd need to repeat the environmental process. At worst you'd have to do a supplemental EIS if the conditions when the extension from Leonard Rd to I-69 would be built were substantially different than anticipated when the FONSI was issued. Mr. Rogers directed the committee’s attention to the map in their packets. He stated that DOTD and FHWA are looking at what might possibly be done along this portion of I-69 between the port and I-49 without disturbing the existing environmental document. Mr. Rogers noted that no action had been taken on this yet. No teling how long it will take FHWA to make a decision. Mr. Tayler Comeaux from BKI gave a brief update on the project to date. Mr. Comeaux stated they had received concurrence on the recommendation of Alternative B2 from both DOTD and FHWA. The process from here out is finalizing the Technical Reports including Line and Grade, Traffic Noise, and others. Following that they will prepare the Draft Environmental Assessment for review by DOTD and FHWA. Upon their approval we could then advertise and hold the public hearing and prepare the final documentation. At this point we are looking at the end of the year or early next for issuance of a FONSI. Dr. Wilson asked to clarify that Alternative B2 is the Alternative recommended by the MPO. Mr. Rogers concurred with this. Mayor Walker asked how we could do Future Corridor signs similar to those that Texas has done with I-69, specifically along the I-69 SIU 14 and 15 Corridors. Mr. Comeaux noted that we would need to work with DOTD. Mrs. O’Neal commented that Lafayette has also done some future corridor signs but that we would need to be sure to work with DOTD on the regulations regarding these signs. Mayor Walker asked staff to reach out to Dr. Kalivoda at DOTD to see what could be done. I guess that is some sort of progress. Mr. Rogers stated that he wanted to just give a quick update on a couple of the projects. He stated that the initial draft EA report for the Inner Loop project had been submitted to DOTD for comments. He noted that DOTD and FHWA have concurred with the MPO on the identification of Alternative B2 as the locally preferred alternative. Dr. Wilson asked Mr. England if this was the alternative preferred by the port. Mr. England stated it was. Mr. Rogers then noted that he has asked the three major consultant for the three main projects being I-49 Inner City, the Regional Thoroughfare Plan, and the 3132 project to be able to provide a very detailed update on the project between now and the June meeting. He stated he asked them for a listing of all the technical documents that had been submitted, when submitted if approved, where the documents stand at date and what it will take to get them completed. He also stated that he wants firm timelines from them for completion of the projects. Mr. Washington asked if we could have an update on I-69. Mayor Walker stated that the President of the I-69 Coalition recently passed away and a new president has not been appointed. He further stated that approximately 5 names have been floated to the state coalition directors for their review but that no one has been appointed as of yet. Mayor Walker stated that the biggest obstacle in the process is the state of Texas and their unwillingness to move forward with the environmental process on the section from Stonewall to Tenaha. The mayor stated that he has again contacted Secretary Wilson and Dr. Kalivoda at DOTD urging them to contact their counterparts in Texas to move forward. Mr. Washington expressed his concern that it seems we are in the same position as we were a year ago. Mr. Brown stated that this is going on a 30-year process and that we need to do something soon in the state of Louisiana. Mr. Brown stated that DeSoto parish stands ready to do whatever necessary to move the project forward. Good luck with that! I can't imagine why Louisiana's short portion of I-69 is any sort of priority to Texas. Yeah, I think they need to put more muscle behind the I-49 projects. The intercity connector in Shreveport is a pretty big project. Same goes for the I-49 project cutting through Lafayette. OTOH, I don't know how close either project is to getting plans finalized (and out of the court room). Extending the Westbank Expressway out of the New Orleans metro is yet another huge project. I'm convinced TX DOT will build I-69 up to a certain point, but then prioritize building I-369 up to the Texarkana area. Arkansas might build bits and pieces of I-69 in/near towns like Monticello. But then I think they'll put more emphasis on getting I-530 extended down to the proposed I-69 corridor before building I-69 down to the Louisiana border. And then that's not factoring in all their priorities with I-49 in Fort Smith, Belle Vista, etc. I believe that TX will build I-69 to where ever THEY decide to build I-69. If they want it to go all the way to Texarkana, by golly that is where I-69 is going to go and to hell with what anyone else thinks or plans. The Lafayette Connector portion of I-49 South is in somewhat a slowdown right now, because the Supplemental EIS is still being developed for some minor changes made in the design from the original ROD signed in 2003. Officials expect to have a Supplemental ROD in place by the summer of next year. The Shreveport Inner City Connector portion of I-49 is well into its EIS process; a Draft EIS is expected to be completed by either this coming winter or spring, with a ROD signed by next summer. The remaining elements of I-49 South are also either ending Supplemental EIS processes or just waiting for money to complete. Completing the upgrade of the Westbank Expressway to US 90 isn't as huge as you might think, because most of the really expensive work, such as the highrise bridge across the Harvey Canal and the elevated sections going west to Westwego, has already been finished. Only extending the freeway portion to US 90 and reworking the interchange there would be needed. To be a little more fair, Texas has a whole lot of proposed miles worth of I-69 within Texas. It's difficult to decide which corridors rank higher in priority. The Houston to Texarkana corridor is a pretty big deal. I think it's also a priority for TX DOT to get the Rio Grande Valley region in the far South end of Texas (and its 1.5 million residents in that cluster of growing cities) connected to the rest of the Interstate system. Even if TX DOT deliberately puts off building its I-69 segment to the Louisiana border the agency will have legitimate excuses for doing so. This situation is just another example of why the federal government has to start taking a leading role again in Interstate highway corridor development. Under the current planning and funding model these corridors will be nothing more than a lot of different local roads strung together in a very irregular manner. There is zero big picture approach going on with this. Of course the funny thing now is the existing sections of the Westbank Expressway are now aging. I remember when they first started building it: back in the early 1980's. My family lived in the area at the time and I was just a teenager in middle school. The rest of the existing highway was completed in the late 80's and early 90's. The newest portions are over 25 years old. Wouldn't at all be surprised if the eventual 69/369 interchange near Tenaha ends up with 369 as the "straightline" from Houston, while I-69 toward LA is relegated to a TOTSO. TX does have its priorities! Nothing new, other than asking if I-69 will still happen in LA. A TV news report video is included with the article. Interstate 69 might still be built in Louisiana (and Arkansas), but it will be at least a few decades before that occurs. Ford said they're anticipating the future corridor of Interstate 69 that will run right through Taylortown. "Imagine I-69 coming through and the growth that will occur because of that," Ford said. The important project finally comes to fruition to connect Bossier Parish like never before. The parish will start acquiring "right-of-way" for land to begin project next year. I hope "imagining" isn't all that will ever happen.